The state will start installing roadside guardrails tomorrow to keep vehicles out of Ka Iwi State Wilderness area. The Waimanalo-bound lane of the Kalanianaole Highway will be closed between 8:30 a.m. and 3 p.m. on weekdays between the Hawaii Kai golf course and Sandy Beach for the next six weeks. Drivers should be prepared to stop and follow directions from traffic officers. GP Roadway Solutions Inc. has a $267,720 state contract for the work. WAILUKU » A baby has been born on the island of Kahoolawe, a largely uninhabited island considered sacred to native Hawaiians. The parents have asked that their names and the gender of their child not be released, said Sol Kahoohalahala, executive director of the Kahoolawe Island Reserve Commission. The couple's request to allow the birth on the island was approved by the commission after reviews in consultation with cultural practitioners. Kahoolawe was used as a target and training area from 1941 to 1990 when then-President George H.W. Bush ordered a halt to the exercises after years of protests and lawsuits from native Hawaiian groups. 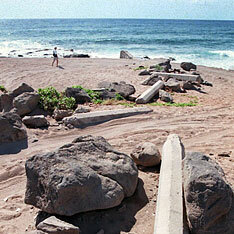 Cleanup began in 1998 and the island has since been deemed for cultural, educational and archaeological activities. The U.S. Fish and Wildlife Service said Friday it will award $2.4 million to the state of Hawaii to help conserve, restore and protect coastal wetlands. The grant is a slice of $18.8 million given to 14 states under the National Coastal Wetlands Grant program, Deputy Secretary of the Interior Lynn Scarlett announced. The Hawaii grants will fund three projects on Kauai, Oahu and Maui and will be supplemented with more than $3.3 million from state government, private landowners and conservation groups. One project will target the Mana Plain coastal wetlands on Kauai, where the state will restore and enhance 141 acres where endangered water birds live. The Pouhala Marsh on Oahu will have 40 acres of degraded wetlands restored to benefit four water birds. The habitat there is endangered due to the spread of mangrove trees and other invasive species. The state will also acquire the Nuu Makai Wetland Reserve on Maui to preserve. The area has a significant wetland complex, 5,000 feet of coastline and endangered water birds including the Hawaiian coot, Hawaiian stilt and Hawaiian duck. The Hawaii chapter of the Society of Professional Journalists will sponsor 14 full- and part-time internships at newspapers, TV stations and public relations firms this summer. Applicants must be Hawaii residents attending college in the islands or on the mainland. Only those who have completed their sophomore year of college by June will be considered. Applications must include a cover letter, samples of work and a copy of a college transcript and must be postmarked by Feb. 19. Full-time summer internships paying at least $3,250 for 10, 40-hour weeks will be offered at the Honolulu Star-Bulletin, the Honolulu Advertiser, Maui News, Pacific Business News, Hawaii Business magazine, Honolulu magazine, Island Scene magazine, Trade Publishing Co., Alexander & Baldwin Inc., and Bright Light Marketing Group. Part-time internships will be offered at KGMB Channel 9, KITV Channel 4, KHNL Channel 8 and KHON Channel 2. Part-time interns will earn $1,750 for working eight 27-hour weeks. Applications should be mailed to Internship Committee, SPJ-Hawaii Chapter, P.O. Box 3141, Honolulu 96802. The forms are available online at www.hawaiispj.org. For more information, call internship chairman Craig DeSilva at 282-1038 or e-mail cdesilva@hotmail.com. A woman escaped without harm after her car slid 100 feet off an embankment on Tantalus last night. The car failed to complete a turn in the 3800 block of Tantalus Drive at about 7:45 p.m. and skidded down a slope, coming to a stop against a tree, firefighters said. Friends of the woman in a second vehicle hiked down and helped her to the street before firefighters arrived. No one was injured, a fire department spokesperson said. A tow truck will remove the car after daybreak today. A 58-year-old man who was found dead in his Kapiolani Boulevard apartment with his hands bound was strangled, according to the Medical Examiner's Office, which ruled the death a homicide. Ted Hiroshi Arifuku was found at 9:50 a.m. Monday with his face down and hands tied behind his back, police said. He was last seen alive in his apartment building's parking garage last Saturday. Police want the public's help in locating Shawn A. Naputi for allegedly stealing designer shirts from Macy's department stores. Police said Naputi and a woman were seen taking several Tori Richards aloha shirts at the Ala Moana Macy's store at about 6:30 p.m. on Jan. 17. Naputi fled on foot, while the woman was arrested, police said. Naputi also stole shirts from other Macy's stores, police said. Naputi is 24 years old, 5-foot-7, 167 pounds with brown eyes and shaved hair. Anyone with information is asked to call CrimeStoppers at 955-8300 or *CRIME from a cellular phone. Police arrested a 23-year-old man for allegedly sexually assaulting a minor in August 2003. He is accused of sexually assault and inappropriately touching a juvenile he knows while the victim slept. He was arrested Friday at his Salt Lake home. Police did not release the victim's gender or age. A 23-year-old woman angry at her 22-year-old husband's use of their laptop computer was arrested on assault charges, police said. The husband left their Salt Lake home after the incident at about 6:30 p.m. Friday and called police. The woman was arrested on a charge of abuse of a family member. A 55-year-old Kapaa woman and a teenage girl were injured in a two-car crash in Anahola about 10 a.m. Saturday, Kauai police reported. Alamita Musika, 55, was driving a van northbound on Kuhio Highway when she collided with a truck driven by a teenage girl that was pulling out of Whaler's General Store in Anahola, police said in a release. The girl, who was not identified, and Musika were both taken to Wilcox Hospital. The girl's condition was not available yesterday. Musika was released from the hospital after being checked for pain in her neck and arm. Musika told police she had her seatbelt fastened and the airbags in the van deployed in the crash. Traffic in both directions was rerouted from the scene for about an hour for a police investigation. Police arrested a 27-year-old man late Friday night for allegedly robbing a man in his home at gunpoint in Waipahu earlier this month. A 32-year-old man was robbed by two men on returning to his home, at about 8 p.m. on Jan. 8, police said. The suspects fled in his rental car. The victim was able to identify one suspect, and the arrest was made Friday evening. Police are seeking the second suspect. Honolulu police arrested a 43-year-old woman who allegedly used a screwdriver to threaten a 73-year-old relative living with her in Kapolei at about 12:35 p.m. Friday. The woman was arrested on charges of first-degree terroristic threatening and abuse of a family or household member.